The MCC property is marked and outlined in blue in the map above. 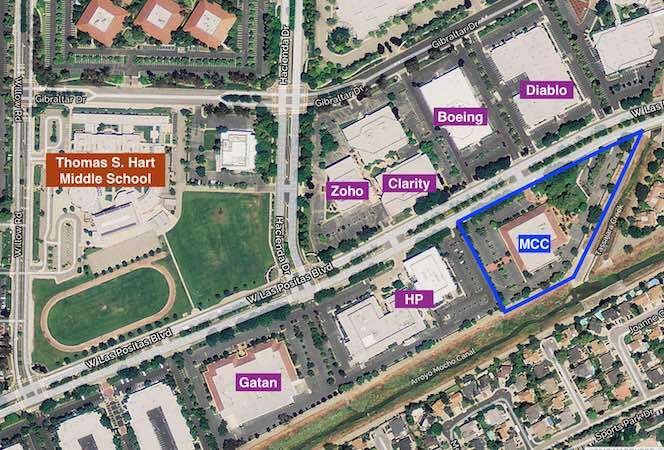 Surrounding business are marked in purple, and Hart Middle school is marked in brown. MCC is located at 5724 W Las Positas Blvd #300, Pleasanton, CA 94588. Parking during Friday Prayers is strictly limited to MCC. Please DO NOT park at any of the surrounding businesses during Friday prayers. Surrounding business (especially HP) reserve the right to tow your vehicle at any time! After 7pm on business days, and during weekends, parking is generally allowed on surrounding business (e.g. HP). Please check the latest MCC newsletter to see if there are any exceptions to this rule.